“Housing prices have increased rapidly in recent years, raising concerns that the market may be undergoing a bubble. House prices have nearly doubled in real terms over the last decade, equally for subsidized and commercial housing, and are almost 40 percent above their peak in 1996. The price hikes have outstripped increases in construction prices and were mainly driven by a rising trend in the capital and two other large cities. However, the increase in housing prices has been less pronounced after adjusted for income levels and the quality of newly constructed housing. House price increases have also surpassed rental increases (…). 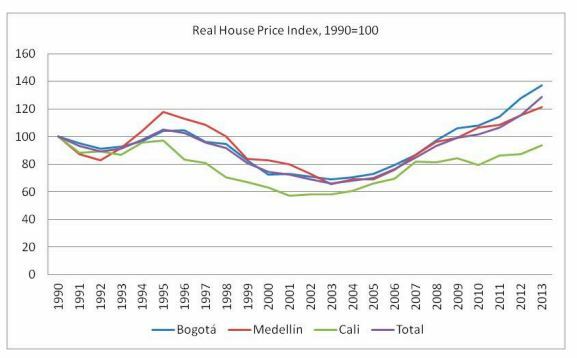 However, household income has also increased strongly in the recent decade, alleviating the burden of mortgages on households and boosting demand for housing,” says the latest IMF report on Colombia.